Matthew Roberts is now claiming that Jason Freeman is NOT Manson's grandson to begin with. Roberts says "new genetic evidence will prove this". Roberts is now seeking a Court Order to DNA test Manson Directly. Matthew Roberts is now hoping a court-ordered DNA test will prove his paternity once and for all. “We’ve been trying to do an DNA test Manson, even though it is a federal offence to take DNA out of a prison, so now we are trying to get a court order,” Roberts told RadarOnline.com in an exclusive interview. “We did it once before and it was inconclusive because the sample was tainted. We just did another test with an alleged grandson that came up negative, but it’s not known for certain if he is really related,” explained Roberts, who claims new genetic evidence is expected to reveal that MMA fighter Jay Freeman, whose nickname is Charles Manson III, is not the helter skelter killer’s real grandson. Submitted by Kimchi! Thanks Kimchi! Kimchi, thanks for staying on top of this!!! Much appreciated! I kind of feel sorry for these guys. I think more than anything else, they thought they had found some family. I guess that's true, but why would anyone WANT to be related to Manson? Although Mathew does everything he can to look like Manson......he much more closely resembles a pathetic meth freak. A UA would probably confirm the later. The fact that he's still pursuing this speaks volumes about his mental health. Here is one good reason to be directly related to the Wooly Hophead, money. While most would find it distasteful at the least, there is a huge marketing value to the name Manson and everything related. Proving that one is a driect blood link could provide all types of opportunities. He does seem to purposely emulate Manson's look... with the long hair and facial hair. Hi PVM! That's what I was thinking too. He would get a lot more audience even if it was just curiosity. Dill, that's what I was thinking. If he could "inherit" any of Manson's personal items, they might be worth some money. I agree with PVM and Dilligaf. I think Matthew believes being related to Manson makes him famous... and could eventually prove beneficial to him financially and career-wise as a musician. Matthew is probably correct in a strange sorta way. Look at that guy Chapman. He thought by shooting John Lennon, he'd become a 'somebody". In a disgusting way... Chapman did make the history books. Matthew Roberts evidently thinks being Manson's son, makes him a "somebody". 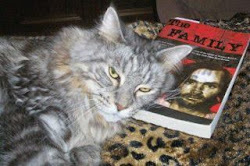 I suppose if writing a book about Manson can make someone famous... being Manson's relative, may in fact, be even better. I really wouldn't be surprised if Matthew writes a book... if/when he can secure DNA evidence of his paternity. The joke will be on us... if he does eventually profit from this... and it's not out of the question. This guy clearly wants to be a Manson relative and I think the reasons why have already been mentioned. Would he be famous? No, he'd be infamous, but maybe he'd be able to make appearances on the sleazy tabloid TV shows occasionally. I guess he still doesn't think his 15 minutes of fame are over yet. As far as I'm concerned they are. Buh-bye. Strange, how his close relative tried hard to stay out of his lime light. His Mother Rosali wouldnt allow the grandson to speak of Manson & his father commited suicide never speaking of being Manson's son. Then you have someone who thinks he maybe Manson's son seeking attention & profit from it. Maybe it's when how they found out about the relationship but I dought it. One see's shame & the other see's $$ signs. I was thinking this guy had white ribbons tied on the ends of his hair. It think it's 2 white silhouettes on his shirt. LOL. There is DNA on every envelope Manson has mailed. Yeah, the DNA of everyone who touched it. LOL. Mr. Peroit, no, the guards seal the envelopes, after reading the prisoners' mail, so there isn't DNA on the envelopes. Charles Jr and/or Jason Freeman's moms could have conceived them by someone other than a Manson, maybe cheated and easier to lie about the real father. I see the resemblance in Robert Mathews face. Its normal to want to know the truth about our biological parents, regardless of the situation! Only DNA will confirm either way. Charles Jr and/ or Jason Freeman could very well be results of infidelity, making them not biologically Mansons.... Robert Mathews resembles Charles Manson in the face. Sounds like he just wants to know where his blood comes from. Nothing wrong with that!